Mapping your vegetable garden before planting will help you see how many seedlings you need, where they will be planted, and how you can keep each bed producing all through the growing season. Late winter is the perfect time to plan your vegetable garden. After enduring snowstorms and cold temperatures for months, I begin wondering whether spring will ever come at all. Thoughts of warmer days and fresh garden harvests encourage me to the next step in planning a vegetable garden: Mapping the Garden Beds. After organizing your seed box and making a seed list, the next step is to figure out how everything will fit into the garden. Before sowing a single seed, it is helpful to sketch a map of the garden so you know how many seedlings you will need, where they will be planted, and how you can keep each vegetable garden bed producing all through the growing season. It is beneficial to rotate plant families from one garden bed to another each growing season. Vegetables that are in the same family use similar nutrients and are vulnerable to the same pests and diseases. Planting different crop families from year to year helps to avoid depleting the soil and prevents crop specific pests and diseases from building up from one season to the next. 1. Allium Family: chive, garlic, leeks, onions, and shallots. 2. Solanaceae Family: eggplant, peppers, potatoes, tomatillo and tomatoes. 3. 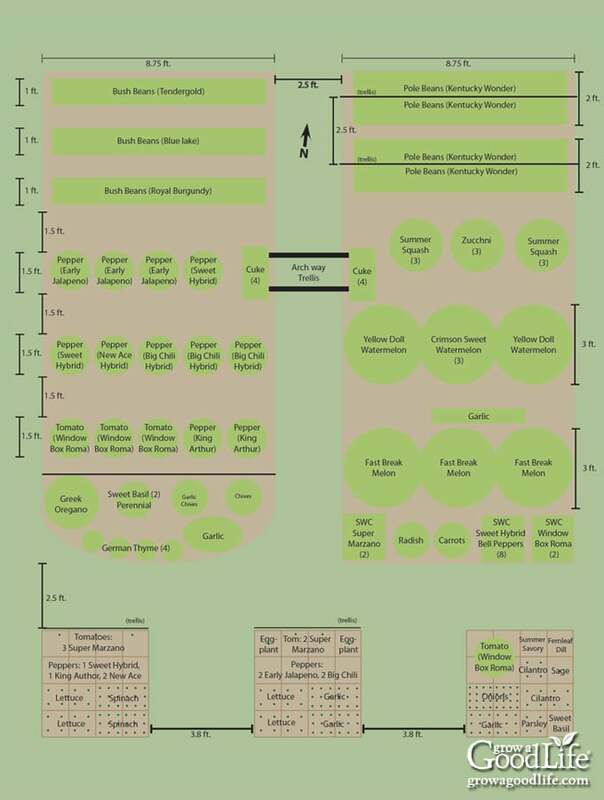 Brassica Family: broccoli, cabbage, cauliflower, collards, kale, kohlrabi, mustard greens, radish, rutabaga, spinach, and turnip. 4. Cucurbit Family: cucumbers, gourds, melons, pumpkin, and squash. 5. Legume Family: beans and peas. The plants in each family are grouped together and planted in the same beds, so I can easily move them to a different bed the following year. Other vegetables such as lettuce, corn, carrots, and herbs are worked in where there is room, but I try not to plant them in the same spots two years in a row. Even in my Maine Zone 5 garden, I can grow up to three crops in the same garden space if schedule carefully. Quick growing crops such as spinach, lettuce, and other various greens can be planted in spring. Once the warmer weather arrives, spring greens usually turn bitter and bolt. These can be removed, fed to the chickens, and the space used to grow bush beans. Once the bush beans are finished producing, a fall crop of spinach, lettuce, and other cool-season crops are planted. More Info: 3 Succession Planting Tips to Maximize Your Harvest. The inventory of the preserved garden bounty from the previous year also factors into the amount of plants in the plan. I don’t weigh my harvests, but do keep notes on the number of plants grown from year to year. At the end of winter, I inventory what is left in storage and decide if I need to increase or decrease the number of plants grown to provide us with enough preserved food until the following years garden begins to produce. More Info: 9 Crops to Grow for Winter Food Storage. Planning begins with a blank garden diagram and the list of plants that you want to grow. 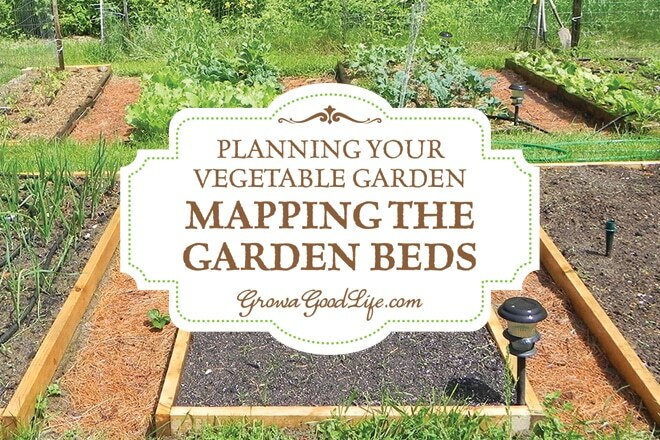 The way you approach mapping out your vegetable garden beds will depend on your priorities. For example, we rely heavily on canned tomato sauce, canned salsa, and frozen tomatoes to use in soups and stews. So tomatoes, peppers, onions, and garlic are considered necessities in the garden and take priority on the garden space. I begin with these crops and plot out where they will be planted for the new season. Then I move on to other crops that will need trellis supports to grow. Finally, I fill in with short seasoned spring crops along with what will be planted once these crops are finished. Before you begin plotting out your garden layout, review the list of crops you want to grow, decided roughly how many plants of each vegetable you would like to grow, and check the seed package to see how much space each plant will need. Step 1: First, make a sketch of the garden area showing the dimensions of your garden beds. This can be done on a computer program or simply sketched out on graph paper. Step 2: Refer to your seed list and begin arranging the crops in the garden map. Use square foot garden spacing or the recommended space between plants indicated on the back of your seed package to estimate how many plants you can grow in an area. Step 3: Start plotting your garden with the crops you consider important. For example, tomatoes, peppers, onions, and garlic are very important in our garden. These are plotted first on my garden map to insure there is plenty of room to grow enough of these crops for preserving. Step 4: Move on to crops that need trellis supports to grow. Remember tall crops should grow on the north side of your beds, so they don’t shade other plants. Plan out where you will grow your indeterminate tomatoes, cucumbers, pole beans, peas, and other crops that will benefit growing with supports. Step 5: Finally, fill in with short seasoned spring crops along with what will be succession planted once these crops are finished. Mapping the garden beds each year will help give you an idea of what garden will look like. It makes it easy to figure out the amount of seeds and seedlings you will need to fill the space. In addition, mapping the garden beds provides a record of what was planted in each location from year to year. The next step in Planning Your Vegetable Garden -> How to make a planting and seed-starting schedule so you know when to sow your seeds. Do you include the lettuce family in the with brassica family? Where do you include roots such as beets and carrots? Nancy, I just work in lettuce, beets, and carrots where there is room. What kind of wood do you use for garden beds? Untreated pine and hemlock. Hemlock lasts much longer. Hi Rachel, Have just come across this site & I’m enjoying all I’m learning, signed up for the newsletter too. We’ve recently moved to Vancouver Island, BC. (zone 8b) & this year I’ll be planting my first veggie garden ‘here’, it’s been over 25 years since I’ve had a veggie garden. There is certainly a lot to absorb with all the amazing (new to me) information available. The new garden area was roto-tilled, the grass composted, weeds removed. Multiple bags of manure, 30 I think, and 2-½ large peat moss were added to the existing clay ground. We purchased soil with sand, humous, compost and added it to the mix. Fall rye & mustard seed were planted and 4″ of seaweed. All sprouted very quickly but has been covered in frozen snow for over a month, It’s been raining hard all day, so I hope to see the yard tomorrow.. I’ve looked at the info on mulches, I thought straw was a hit, but I’m concerned about it seeding down & mold? I’ve started a garden binder, with all the research notes. I will go through your info, edit, print & add to the binder for reference & reminders. I do not have raised beds, flower and veggie gardens have all been amended, the best we could. I really appreciate your advice to plant veggies in families, I have not come across this. Companion gardening & planting for the “Bees’ are my main focus, so I will not be planting in rows (I don’t think). Thanks again for enlightening me & I look forward to ‘More’..
Hi Donna, It sounds like you are on your way to a great gardening season. One thing to remember is that there is no right or wrong way to grow food. It is all trial and error to figure out what works well for you. Straw mulch, unlike hay shouldn’t have seeds. Or if it doesn, it shouldn’t have many seeds. Straw is the hollow stalks left over after threshing oats, wheat, or barley. Mold shouldn’t be a problem unless you have drainage issues. Straw mulch does break down, but as it does, it adds organic matter to the soil. You should cover your soil with some sort of mulch to help prevent weeds, hold in moisture, and prevent nutrient loss. You can learn more about mulch here: 5 Ways Organic Mulch Helps Your Garden. You can still use crop rotation in your garden; just divide the plot into sections and plant by family with companion planting worked in. Or you can mix it up. It is all up to you. Most importantly is that you have fun and enjoy the process of nurturing your plants. What family is okra in? Charlotte, Okra is in the Malvaceae botanical family. There aren’t many other garden vegetables in this family, but you can group it with the Solanaceae family because it has similar growing needs. Feel free to plant okra in the same beds as eggplant, peppers, potatoes, tomatillo and tomatoes. Margaret, Yes, isolation is very important if you are saving seeds but you really need a large distance (up to a mile) to try to keep the plants isolated. It is really difficult to do in a backyard garden surrounded by other folks who garden as well. Bees and wind can spread pollen a mile away. Tomatoes and beans are considered self-pollinating. These are less likely to cross-pollinate, but it can happen. Impressive write-up! 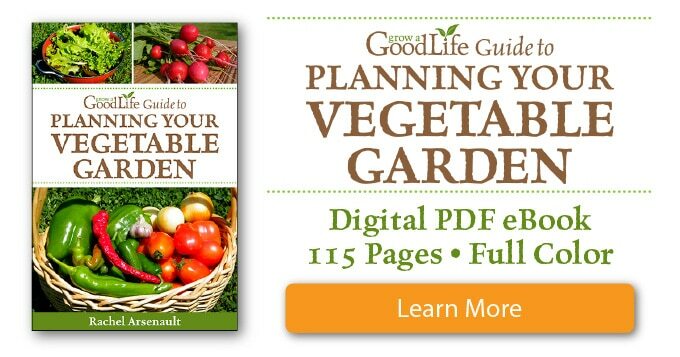 Great guidance on vegetable garden. You have share very useful knowledge. This would be a great help for the gardeners especially newbies like me. Thanks a lot. I am new to your site and I am really enjoying it! Your articles are so informative and your instructions are so easy to follow. Thank you for giving your time and knowledge. Rebecca, Thank you for your kind comment. I have learned so much from other gardeners over the years. I enjoy sharing what works for me in the hopes that it inspires others. Thanks for this article and reminder that I need to get this year’s garden planning started. Thank you for linking up to the Let’s Get Real Linky Party! I’m pinned this to our party board and have chosen you as one of my featured bloggers this week. Please stop by and grab a blog button when the party goes live Thursday at 5PM EST. Seeing you mapping out your garden beds is a reminder that spring really will come — as difficult as that may be to believe right about now. The lengthening days also give me hope. I’m very grateful that this last storm missed us. Jean, This was the best blizzard ever! I am so happy we did not receive the predicted additional foot of snow this time around. I am trying so hard to think spring right now and planning the garden is helping boost my spirits. I adore mapping out my garden beds each winter. I usually do it several times just because I enjoy it so much. lol Thanks for sharing at the Homestead Blog Hop this week! I am new-ish to food gardening but I have big ideas. Signed up for your newsletter because there seems to be such good information for someone like me. Thanks for sharing on Merry Monday! Mapping beds is what keeps us going through the winter! Can’t wait to start putting them in come spring. Great post! Actually I have a follow up question – I am starting some new beds in a location I don’t think has ever been tilled before. What are your recommendations for adding to the soil and starting mulch on a new bed? Hi Kirsten, Compost will be the best thing to add to a bed no matter what the quality of the soil. Organic matter will help soil structure and provide nutrients. After digging the bed, add at least 4-inches of compost and work into the soil. I would also suggest getting a soil test to see if there are any nutrient deficiencies (http://www.csrees.usda.gov/Extension/). 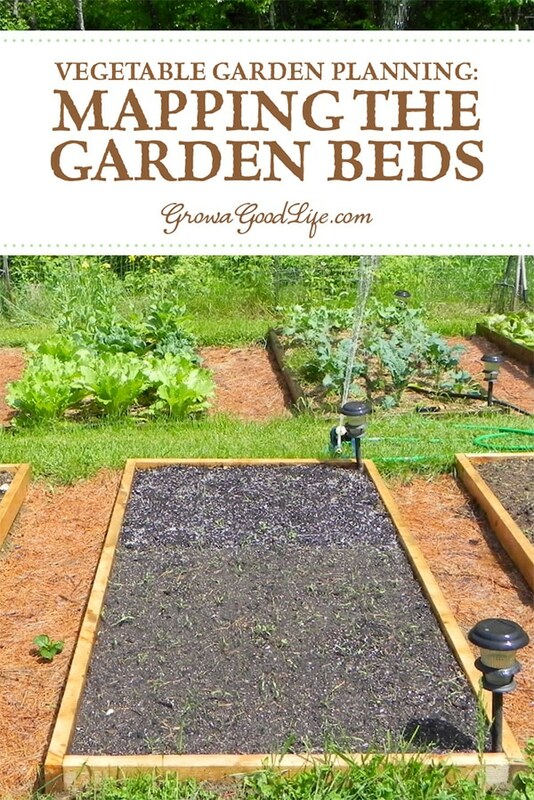 If you start digging the beds and find the soil too poor, you can always add a square foot garden on top of the soil (https://growagoodlife.com/square-foot-garden/). For mulch, I really like using straw. I hope this helps. You are just a gardening queen! 🙂 Thanks for sharing all your wonderful information with us on the Art of Home-Making Mondays each week! 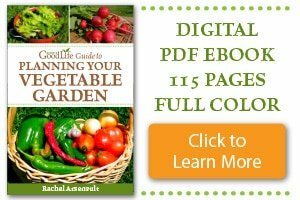 You have a great guide to starting a garden. I especially like the idea of vertical that work so well for people that have limited space and produce quite well in most cases. Thanks for sharing all your knowledge. Visiting from Homestead blog hop. Pinned & twitted. I’ve never been good about mapping out my garden. Usually every year I just have a sense of where I want things to go and hope that I have enough space. Usually it works out one way or another but I definitely see the benefit of visualization. Hi Terry, Thanks for reading and commenting. Our soil is pretty sandy as well. I have to add lots of compost every spring and fall to add nutrients and help with moisture retention. Haven’t been following very long but find your info helpful. I haven’t had a big success with my garden as we have mostly sandy soil that I have been continually adding compost, manure etc to. Hope it will be better this year. I also want to build some raised beds. I used to have a three year rotation, but since I can’t even eat solanums and legumes (though I’m growing some of the latter), my family groups are not as numerous. I tend to have a two year rotation. Plus I have a section of warmer garden area that I do a two year rotation within there because I like the melons and sweet potatoes to have the warm spot. My diagram is now in my computer. I print it out each year and mark it up manually. I like to do it with a pencil so I can keep changing my mind easily. I’ve never gotten into the computer design of the garden, but I do like the hard copy of the empty garden space on the computer. Daphne, It took a while to get most of my planting organized by families in the same bed, but it is still a challenge to rotate because I grow more in the Solanaceae family than the others. Sue, the electronic planned sounds like it is extremely helpful. By the way, I find your newsletter (I have a lot of trouble with the word “blog”) to be VERY informative and worth my time to read. I have been gardening for several years but it’s been sort of a game where I go stick a seed in the ground and what comes up tastes pretty good, so I plant something else and see what happens. Nice to have someone reminding me that I need to succession plant and rotate. I was forced into retirement in Mid December, last year and suddenly, gardening has become “farming” and we are gonna be much more dependent on what comes from the garden, not only because it’s cheaper, but also because it’s non-GMO, and BECAUSE it DOES taste better than anything we can find at the grocery store. Everything there, as you know, is trucked in from all over the WORLD, and I can’t count on taste or quality or wholesomeness. Hence, I garden, ahem…farm! Larry, Thank you for your kind words. I have learned so much from other bloggers and enjoy experimenting with creative ways to grow a garden. I enjoy planning everything out especially when there is so much snow outside. Once the growing season begins, there is so much to do. I almost always over plant. This way, if a marauding herd of hungry, rabid deer attack, they will not harm me much. If I end up with too mjuch for my own needs, I have 3 grown daughters with families of their own, and they are ALWAYS willing to help out with any overflow. I try to over plant too but sometimes the deer win. I had no fall greens last year because of deer. I need to build some hoop protection this year. Margaret, Even though I have several years experience trying to plant enough for winter preservation, it is still a guessing game. A cooler than normal summer, poor crop, disease, or deer can have a huge impact on the harvest. I try to compensate for the unexpected.